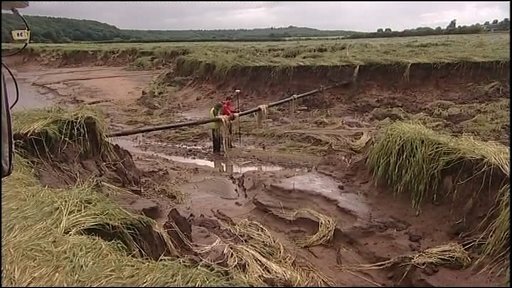 Floodwaters have carved out a huge trench across a 25-acre barley field in County Durham. The trench - dubbed the Grand Canyon of Durham - measures 80ft at its widest point, is 14ft deep and several hundred metres in length. It appeared at Houghall College, near Durham City, after the area was hit by torrential rain at the weekend. When the waters receded staff found the trench, which is thought to be a forgotten branch of the River Wear. Peter Whitfield, from the agricultural college, said: "We had just reseeded the field and put the barley in and it was in good condition. "We are going to have to contact the Environment Agency and Defra to see exactly what we can do with the feature that has now been created. "It looks like the Grand Canyon and it shows what mother nature can do." The trench has proved an attraction for nearby residents and workers. Experts from Durham University are now examining the scene to establish if any damage has been done to the River Wear by the tons of displaced material. It is thought Durham monks diverted the River Wear in the 15th Century to avoid the city's cathedral and castle becoming waterlogged.